A railway station opened 10 years ago has made a "massive" difference to a town that was once the largest in the UK not to have one, an MP said. Corby station opened on 23 February 2009 with a service of one train a day to and from London ahead of the launch of a full service two months later. MP Tom Pursglove said the station had "boosted jobs in our local economy". The MP and rail staff cut into a birthday cake at a ceremony to celebrate the anniversary. The original Corby railway station, built at the end of the 19th Century, was closed in the late 1960s. 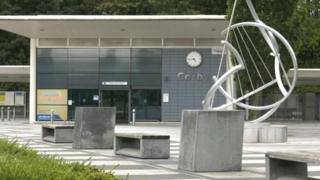 That left Corby, with a population of about 60,000, as the largest town's in the UK not to have a station. Conservative Mr Pursglove said: "Reviving rail connections to Corby has made such a massive difference to the town. "Not only has it been a key part of driving the housing growth agenda locally, with thousands of people coming to live in our community from across the country, but I know it has also boosted jobs in our local economy," he said. "Many national and international firms I visit cite our rail connectivity as one of the key reasons for them being based here." David Fursdon, Corby rail user, said: "There can be no doubt the reopening of Corby Railway Station has boosted the town's ongoing regeneration and given Corby citizens access to the greater UK rail network." Lawrence Bowman, commercial director for East Midlands Trains, said: "The station has grown in popularity over the last 10 years and, with the completion of electrification in December 2020, we hope that our passengers will continue to enjoy travelling through the station for business and leisure."